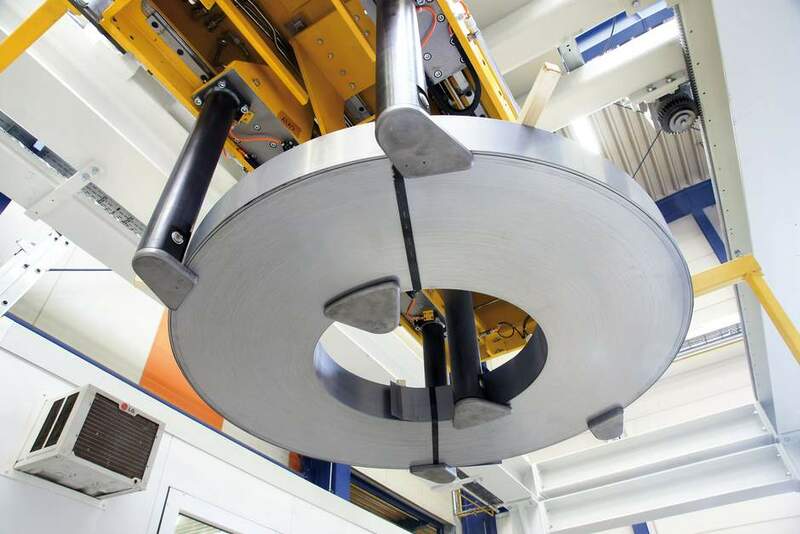 In the Packaging Lines product range, RICC Europe GmbH is able to offer strapping and stacking lines as well as handling systems for coils and slit strips. In addition, we offer wrapping machines for rod and ring-shaped products with turntables and conveyors for long goods. The packaging lines enable significant productivity advantages both for the retrofitting of existing lines and for the commissioning of new lines. Our systems are generally offered both as semi-automatic and as fully-automatic integrated parts of the respective line. Our main focus for the retrofitting of existing slitting lines is on an improved handling of slit strips, creating advantages for our customers in terms of reduced personnel costs for packaging and the avoidance of intermediate storage costs at the slitting line. For us, retrofitting of existing lines is completely independent of the line manufacturer. In addition to complete systems, we also offer stand-alone machines, such as for example for all kinds of thin, magnetizable slit strips. These machines, designed for the handling of slit strips, are called coil handlers. They solve the problems resulting from the suboptimal winding of slit strips and continuously provide reliable and cost-effective results. We would support you right from the planning phase by providing qualified process analysis and simulation of the relevant logistics and packaging processes. The result is the specifications that meet all site requirements as well as their customers’ full product range. This would allow us to achieve a highly customized system that represents the optimal solution for our clients. The integration of our packaging lines into new slitting lines is based on system integration and automation, which are the decisive factors for increased productivity over the entire line. – So, in case you are struggling to achieve more production speed, or trying to save some manpower costs, invest in our capability and we would never let you down. Contact Us to figure out more about our strengths in this field.